Home > Things My Beard Might Lift	> Lift 3 will be 20 pounds! Wait. 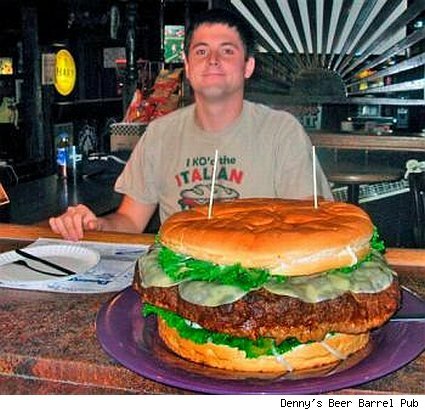 Is that burger really huge? Or is that man really tiny? So, you’re lifting the burger then, right? RIGHT? The beard is magic. It has it’s own zip code now. Lift a cat! A pudgy cat, I guess. Or an infant! What about something Easter/spring-y…like 20 pounds of Peeps, or one of those rabbit banks with the crazy red eyes! Does it hurt when you lift things with your beard? I don’t want you to get hurt. If you can get free toner, you are in the money. When The Beard falls in water it doesn’t get wet. The water gets Bearded. Should I offer up the Vanilla Gorilla for next week? He weighs approximately 31 lbs…. Lift 3: Grand Prize Game Bucket Full of Stuff! First Cut of the Beardumentary!